Year 2 of the iDream program was a clear success for Richardson 7th-graders and local professional mentors. 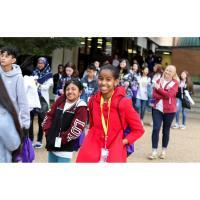 More than 300 students from Forest Meadow, Lake Highlands, Apollo and Liberty schools attended iDream 2019 at Richland College to learn about careers and the different paths to success. The program is an initiative between the Richardson Chamber’s Education and Workforce Committee and the Richardson Independent School District. "We want students to learn more about in-demand careers and take relevant coursework in high school and college to help prepare the for these opportunities," said Raul Hinojosa of UT Dallas and a member of chamber's education and workforce committee. Students attended sessions focused on their career interests, such as STEM, education, hospitality, business/marketing/finance, health science, public services, arts and communications, and architecture and construction. The event was sponsored by Richland College, RISD, UT Dallas, Alliance Architects and McCarthy. Speakers represented 26 businesses from the N. Texas area. An overview video of the day's activities can be seen here. Photos and video resources courtesy of Richland College.